HAPPY NEW YEAR friends! Woohoo! What a great year 2014 has been. I am completely blown away by the love and support Gather & Feast has received over the past three months since launching. Thank you all so much. Here’s to a FAB 2015! I have many new recipes and gatherings already planned for January and I can’t wait to share them with you all. 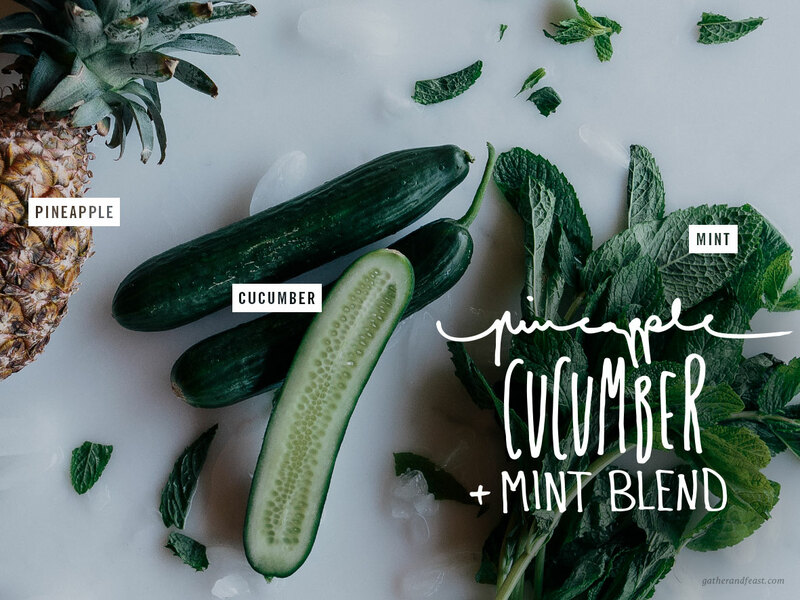 I thought I’d kick off the new year by posting one of my favourite blend recipes... my Pineapple, Cucumber and Mint Blend! It is a deliciously refreshing drink and a great way to start the new year (especially after all the Christmas and New Year feasts over the holiday period). The pineapples frothy texture is also perfect for pouring into popsicle moulds and freezing for an icy treat. PS: You can find this, a fabulous watermelon blend, and many other amazing juice recipes inside my recipe eBook - ‘Morning, Noon & Night’ which can be downloaded here for FREE! Add the pineapple, cucumber and ice into your blender and blend on high until combined. Pour into glasses and serve. The pineapple will give this blend a nice frothy texture. Enjoy!